Our challenge was to promote Peppa Pig coming to the big screen with all new episodes to our family audience across the UK. Our solution was a to create a high impact radio campaign to reach the 2-5 year old audience and their families. We integrated the campaign within our Fun Kids Junior afternoon show which is programmed specifically for pre-school aged children. We also leveraged our social media presence (Facebook, Twitter and PopJam), website and parents’ newsletter to make the campaigns unmissable across all platforms. Peppa Pig sponsored a popular afternoon show, Afternoons with Dan to further promote the news that Peppa was coming to the big screen just in time for the Easter Holidays. All the show imaging, both online and on-air was updated to include Peppa Pig, making the cinema event unmissable to all station listeners. The sponsor credits aired 3 x per hour of show and during the promotional trailer for the show which ran during other station programming. 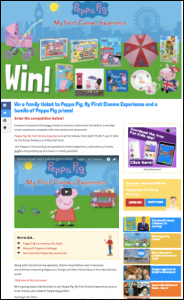 We ran a giveaway to drive engagement between our audience and the Peppa Pig brand. 5 lucky winners were selected to receive a family ticket to a cinema near them to see Peppa on the big screen, plus an exclusive merchandise bundle. The competition was promoted by presenters on-air across all our pages. The audience entered online by answering a multiple choice question on a fully Peppa Pig branded page. The data capture from this was shared with the client.